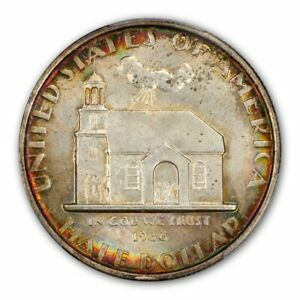 Question: Which United States coin is dated 1936, was struck in 1937 and commemorates an anniversary in 1938? 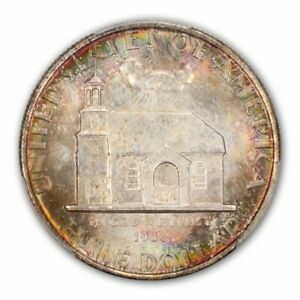 Answer: The Gettysburg half dollar - well, yes and no. 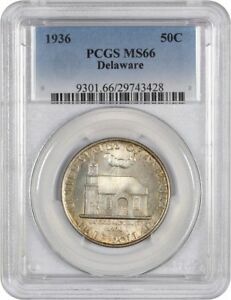 While that's true of the Gettysburg half too, the coin in question is the Delaware Swedish Tercentenary half dollar. 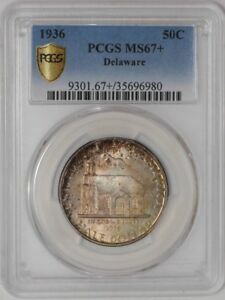 It's one of the less remembered of our commemoratives, but it's still an attractive and historically significant coin. Although the present state of Delaware was explored by Henry Hudson in 1609 and by English adventurers the following year, even being briefly settled by Dutch colonists in 1631, the first European community to take hold and thrive in this land was created by Swedish and Finnish immigrants in 1638. Setting sail from Sweden the previous year, these brave souls arrived in the New World under the sponsorship of The New Sweden Company, an enterprise created to exploit the fur trade then developing. Their two ships, the Kalmar Nyckel and the Fogel Grip, under the command of famed adventurer Peter Minuit, arrived in what is now Delaware in March of 1638. The immigrants made their first settlement at a place called "The Rocks," naming it Fort Christina after the young daughter of Sweden's King Gustavus Adolphus. This site is now a park within the city of Wilmington, Delaware. The lands along the Delaware River were already claimed by the Dutch colony of New Netherlands to the north and by the British colonies of Maryland and Virginia to the south and west. It wasn't long before the Dutch attempted to enforce their claim, and both sides alternately prevailed over a period of several years. Eventually, the intervention of the Dutch West India Company with its mercenary army forced the Swedes to capitulate, and the name New Sweden passed into history in 1655. The British capture of New Netherlands in 1664 (thereafter called New York) made the remaining Swedes and Finns subjects of the English Crown. A few years later, Britain assigned the Delaware lands to William Penn's colony of Pennsylvania. As Delaware was still claimed by Maryland, however, border disputes continued until 1750. By the time that independence was declared by the American Colonies in 1776, Delaware had established its own identity, becoming the first state to ratify the Federal Constitution in 1787. As the 300th anniversary of Swedish-American settlement approached, a Delaware Swedish Tercentenary Commission was formed under the direction of C. L. Ward, chairman. Its purpose was to arrange for celebrations planned for 1938 commemorating the arrival of Swedes in America. Although the first landing had been in Delaware, the states of Pennsylvania and New Jersey would also participate in celebrating their Swedish heritage. 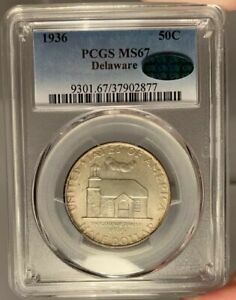 Legislation was passed May 15, 1936 which authorized the coining of not less than 25,000 Delaware Tercentenary half dollars, to be coined with a single design and at a single mint. These clauses were included in response to the abuses perpetrated by other commemorative coin sponsors, many of whom had additional coins minted with minor changes so that collectors would have to purchase additional specimens. An open design competition with a $500 prize drew 40 entries and was judged by the Mint's Chief Engraver John R. Sinnock and by noted sculptor Dr. Robert Tait McKenzie. It resulted in the selection of Carl L. Schmitz as the winner. Appropriate to a celebration of the immigrant, Schmitz was a German-American born in France! The judging was performed Schmitz's models were delivered to the Federal Commission of Fine Arts in November of 1936 and were forwarded to the Commission's sculptor member, Lee Lawrie, for his review and comment. Lawrie noted that "These models seem to me to be made by one who understands his business - they are excellent." He expressed concern, however, that they be accurate in their depiction of the two subject elements: the immigrants' ship, the Kalmar Nyckel (Key of Kalmar, a Swedish city), and the Old Swedes Church (built in 1698-99, although shown on the coin with subsequent additions). 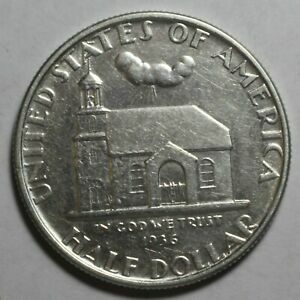 Tercentenary Commission Chairman C. L. Ward responded to an inquiry about these elements by noting that the roof line of the church was not quite correct, and he included some additional comments about the positioning of the mottoes and legends. The Commission of Fine Arts then approved the designs on December 14, 1936, subject to the modifications directed by Ward. Designated as the obverse by the issuing commission (and as the reverse by the Mint) is the side depicting the Kalmar Nyckel under full sail. Below it is the motto E PLURIBUS UNUM and the legend LIBERTY. 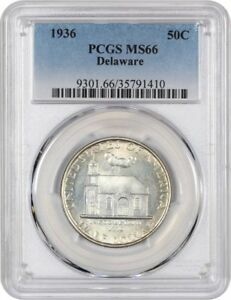 Arranged in arcs around the periphery are DELAWARE TERCENTENARY and the commemorative dates 1638 1938. These inscriptions are separated by three diamonds, a reference to Delaware's motto "The Diamond State" and to its three counties. The designer's initials CLS appear to the right of the ship. 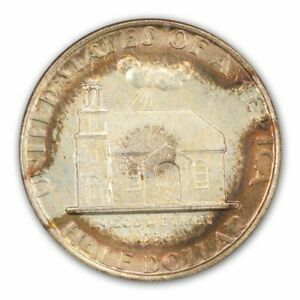 The reverse is dominated by an elevation view of the Old Swedes Church, claimed to be the oldest remaining Protestant house of worship in the United States. 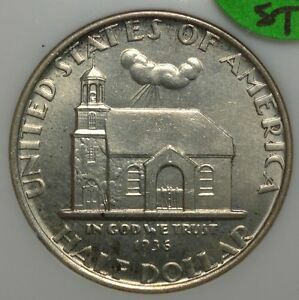 Above it are the Sun's rays piercing through a cloud, while below are the motto IN GOD WE TRUST and the intended date of coining, 1936. Arranged around the periphery are UNITED STATES OF AMERICA and HALF DOLLAR. 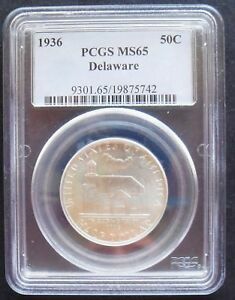 A total of 25,015 Delaware halves were coined in March, 1937 at the Philadelphia Mint (the odd 15 were reserved for assay). 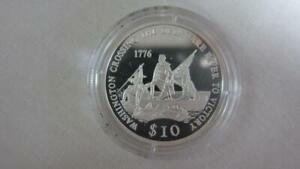 These were offered by the Delaware Swedish Tercentenary Commission at $1.75 per coin. Distribution was handled through the Equitable Trust Company of Wilmington, Delaware. 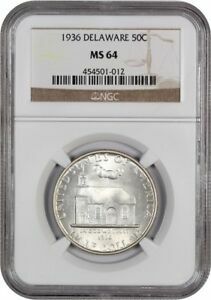 Some 4,022 pieces failed to sell within the allotted time frame (presumably through the end of the 1938 celebrations), and these were returned to the Mint for melting. This leaves a net mintage of just 20,993 pieces. 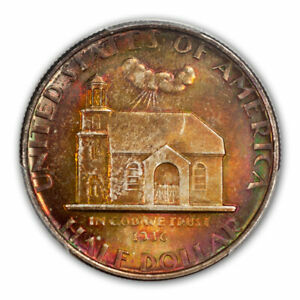 Coins of this issue typically have luster which ranges from prooflike (possible presentation strikes?) to semi-prooflike, to brilliantly frosted, to dull and frosted. Of the few prooflike specimens encountered, most will display this quality on only one side. 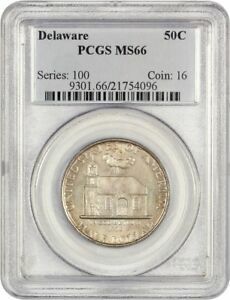 Delaware halves are generally well preserved, with most surviving coins falling into the grade range of MS-60 through MS-64. 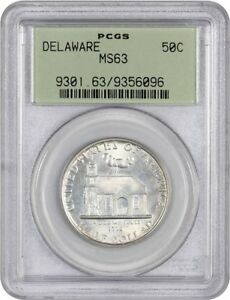 Because of this issue's simplicity of design, with its large areas of exposed surface, Delaware halves are quite susceptible to nicks, abrasions and slide marks (fine, horizontal scratches imparted by the plastic slides of coin albums). 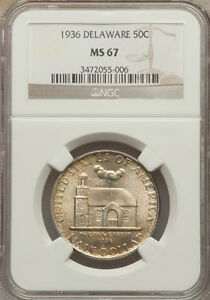 For that reason, examples grading MS-65 are scarce, while higher-grade coins are quite rare. Most pieces are not fully struck in their centers. Potential weak spots include the lower mainsail (at the coin's center) and the gable above the arched doorway. 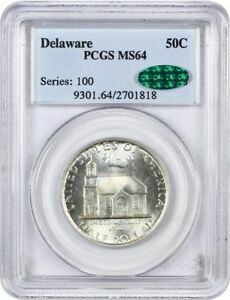 Some Delaware halves are found in grades EF-40 through AU-58, usually as the result of mishandling or harsh cleaning. Look for wear on the lower mainsail and on the gable above the doorway arch. 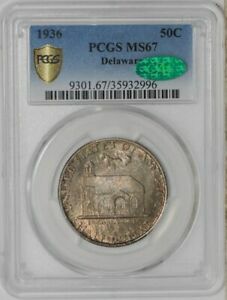 No proofs of this type are confirmed to exist, but matte proof coins may have been struck to the order of Chief Engraver Sinnock. Collectible tie-in items include the Swedish-Finnish Tercentenary 3c stamp of 1938 and the 2 Kronor coin of Sweden dated 1938, which also depicts the Kalmar Nyckel. 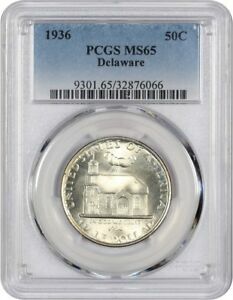 A final item sought by commemorative collectors is the original packaging for the Delaware half, which consists of a cardboard holder for up to five coins, bearing on its outside illustrations of both obverse and reverse, the name of the issue and the event commemorated. 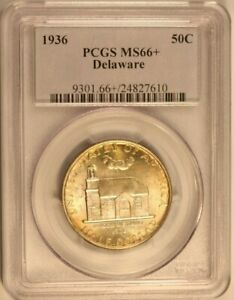 On the inside are a history of Delaware and a description of the coin. 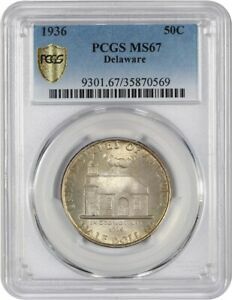 1936 DELAWARE 50 C PCGS MS 65 GEM SILVER COIN .